DON’T EVER SAY that woodworking is a man’s field. Laura Zahn would beg to differ. Zahn is owner of Off The Saw, one of LA’s finest collaborative wood shops. 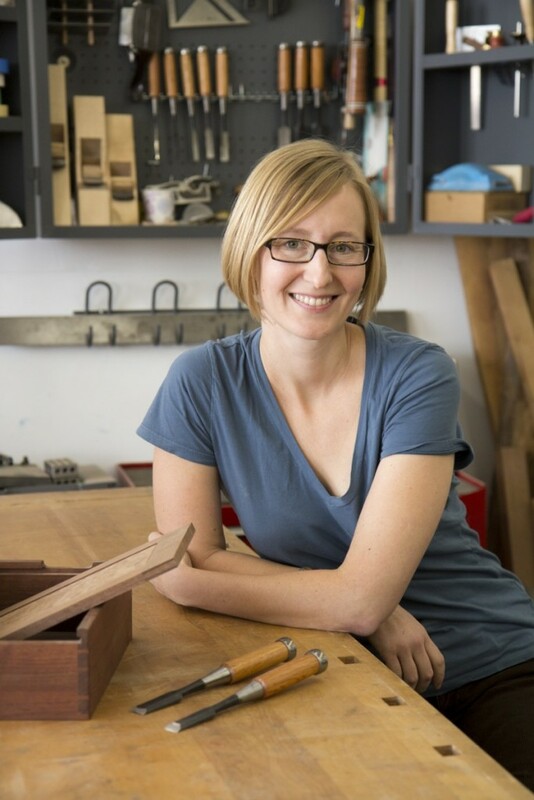 A graduate of the highly-esteemed College of the Redwoods Fine Furniture Program — where women make up 33% of the graduating class, incidentally — Zahn splits her time as owner of Off The Saw and as a woodworking instructor at CSU Long Beach. 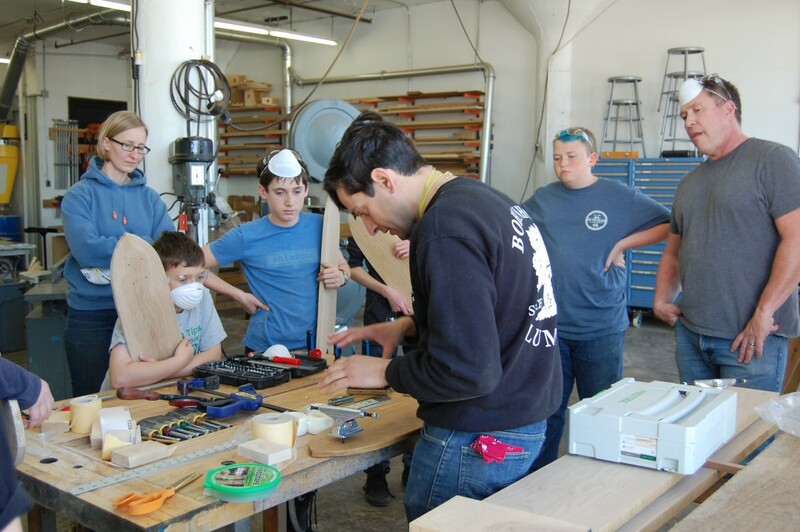 The master woodworker spoke with Lady Clever about the conception of OTS, the gender gap in woodworking, and what Off The Saw brings to the community table. What inspired you to get into woodworking? I have always been surrounded by this type of work. My father was a furniture maker and my grandpa worked in a lumberyard. Before I started woodworking full-time, I was working for climate policy, a typical long-term desk job. It was hard to feel that I was making any progress in that world. Furniture is the complete opposite; you begin with the design, you build it, and put it into the world. I’ve always been attracted to this type of work because it’s functional and beautiful; you could touch it, feel it, smell it, and that’s always been very satisfying to me. What motivated you to open Off The Saw? It was a luxury to be able to attend such an intense program at College of the Redwoods without any interruptions or distractions. It’s pretty difficult to do that in day-to-day life. Moving back to L.A., I wanted to work in a space that provided high-quality tools and good people to work with. I was really surprised that this kind of space didn’t already exist out here. There were some community workshop spaces just starting to get off the ground, but they were also a little more DIY-weekender-type spaces, not the type of place for serious craftspeople. After working with Offerman Woodshop for a year, I saw an ad on Craigslist for a workspace in the Garment District. I fell in love with the place immediately and then scrambled to get it all together. I signed the lease in April and started advertising a workshop in June. I had two months to get this shop together with a full-time job and limited money. I sent out press releases and fortunately, it was picked up by the L.A. Times. The article helped us advertise the space and the workshops we offered at the time sold out, which was huge for OTS because the workshops gave us the money to continue to invest in tools. Tell us about your collective. Do you offer classes as well as your own services? We offer a community space for people to come in and work, but our sense of education within our community is also growing. We are creating a workshop series, as well as youth workshops, apprenticeships, event hosting for other furniture makers, and tool events. We’re currently holding discussions about the business side of woodworking, since many of us have come to find that marketing ourselves is the hardest part of our trad. One question we grapple with, for example: “How do we come up with a good product that can get into market and sell at an affordable price?” If I could make something for everyone I would, but the reality is that it costs a lot of money to create a fine piece of furniture. If you’re truly building something from scratch, it takes a long time, and people don’t seem to understand that. I think we’ve got a long way to go in educating our consumers. Are there many women in the woodworking field? I don’t think there are a lot of women in the field yet, but I think there are more now. I also think it is a growing number because there are more efforts to involve women in this particular field. There are groups, like Women in Woodworking, that try and bring women in. There is a conference run by Furniture Society each year. This year they are having a panel specifically on women in woodworking in Philadelphia. I feel very fortunate that I have a strong network of women I can work and collaborate with — women who know what they’re doing. Do you think sexism is more rampant in a field like woodworking, as opposed to other fields where the sexes are distributed more evenly? Luckily, I work in L.A, which is a very progressive city. If I were working in another part of the country, I think I would face more sexism than I do here. But interestingly enough, a lot of the times I face sexism it’s from women who aren’t woodworkers. People tell me I don’t look like a furniture maker — essentially that I’m not a man with a beard and a flannel. Occasionally I’ll find a tool off Craigslist and my husband — who doesn’t know anything about tools or furniture-making — usually goes with me. When I engage with questions about the tools the person will listen to my question, then turn and answer my husband, not knowing he’s just the muscle! Occasionally, sometimes I feel like I have to put myself beneath the other person in terms of knowledge or experience, but it isn’t very frequently. There has been a lot of support so independent businesses and local crafts in recent years. Do you think this will open the doors to spark women’s interests in woodworking? Yes, we absolutely are seeing a resurgence in the field of crafts. For over a decade, we’ve been very electronically-oriented, always on our phones or computers, and we feel a little disconnected. I think people are wanting to make things for themselves and have tangible skills. They are looking to make and purchase locally-produced, hand-made items. They want that connection to a maker and want to be able to tell a story about their coffee table. I think people want to hone a special craft, and it’s opening doors for people to want to do that, particularly women. What does being a local craftsperson mean to you? I feel very fortunate to be a woman in this field. I have women from all around the country contacting me who are interested in launching their own collective. I’m really into collaboration and offering advice, sharing experiences and information. I feel that if someone else is succeeding, then I am too, because it all comes back around. I also feel fortunate to be able to make things with my hands, and create things that I love. It’s a hard thing to do financially, but I’m finally in a position to be able to teach and work. Follow Laura and OTS’s latest endeavors, like her newest collaboration with Angel City Lumber, a company that salvages and reclaims L.A.’s fallen trees.